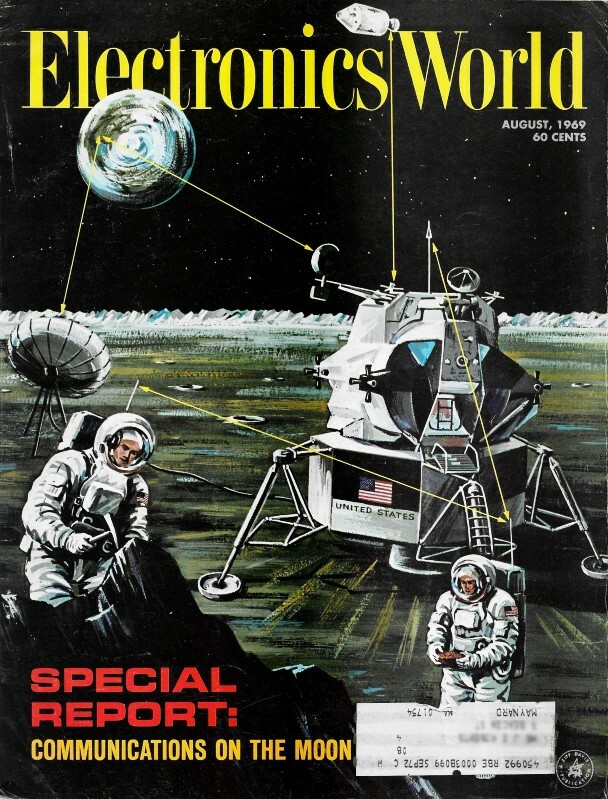 Author Thomas Haskett uses this space in a 1969 issue of Electronics World to clear up misconceptions about how stereo FM radio broadcasts are accomplished. It is not only about the mechanics of frequency modulation itself - terms like frequency deviation and modulation index (often erroneously confused or equated) - but also pre-emphasis, SCA (Subsidiary Communications Authorization), simplex and multiplex operation, sum and difference channels, etc. This is a good review of FM broadcasting without all the messy mathematics on which engineers thrive. An attempt to clear up a few misconceptions about this important hi-fi medium. A description of the signals transmitted by FM broadcast stations, whether they are using mono, SCA, or any combination of these. Ever since Major Armstrong demonstrated frequency modulation in 1936, technically knowledgeable people have been getting erroneous impressions of it. Simple monophonic FM - which went into commercial service as a broadcast medium in 1941 - isn't too difficult to understand. But in 1955 a new technique was added to FM broadcasting - subsidiary multiplexing, also known as SCA or background-music operation. Then, in 1961, came stereo-FM broadcasting. The result is that today many engineers and technicians alike have little or no understanding of what sort of signal a modern U.S. FM broadcast station transmits. Words and phrases relating to FM are often misused and misunderstood. Simplex means the transmission of a single program or channel of intelligence on a single carrier. Multiplex obviously means the transmission of two or more programs or channels of intelligence on a single carrier. FM multiplex means, then, the transmission of two separate programs - or channels of intelligence - by means of a single FM station. The phrase means either stereo or SCA operation - or both. People often say "FM multiplex" when they are talking about SCA; others use the same phrase to denote stereo operation. Stereo FM multiplexing is one thing; SCA FM multiplexing is quite another. To understand what's transmitted by present-day FM broadcast stations, it's convenient to use five specific examples - the five possible modes of operation for any FM station in the U.S. These are: station A transmits a single monophonic program only; station B transmits a monophonic main-channel program and one SCA sub channel service; station C transmits a monophonic main-channel program and two SCA sub channel services; station D transmits a stereophonic program only; and station E transmits a stereophonic program and one SCA subchannel service. Fig. 1 - FM transmitter output fully modulated with single tone. When a transmitter is frequency-modulated, the modulating signal shifts the transmitter frequency. FCC rules define 100% modulation for FM broadcast stations as a transmitter frequency deviation of ±75 kHz. Fig. 1 illustrates this principle. Assume that station A is assigned a frequency of 101.1 MHz; .that is the unmodulated or center frequency of the transmitter. Suppose a 5000-Hz sine wave is fed into the transmitter, modulating it to 100%. The transmitter frequency deviates ±75 kHz, or from 101.025 to 101.175 MHz. By FCC rule, all FM broadcast stations are required to transmit main-channel (monophonic) programs with a frequency response of 50 to 15,000 Hz. Another FCC rule provides that the transmitter audio input contain a pre-emphasis network which boosts the audio frequencies above about 1000 Hz. Pre-emphasis provides better signal-to-noise ratio at high frequencies. To provide flat frequency response for the listener, a complementary de-emphasis network is used in all FM receivers. Fig. 2 shows the FCC pre-emphasis curve. The solid lines are FCC limits and the dashed line is an approximation of the typical main-channel audio-frequency response of an FM broadcast transmitter. Note that a signal at 15 kHz is boosted approximately 15 dB above signals at 500 Hz or less. Thus, if station program material contains signals at various frequencies from 50 to 15,000 Hz, only the 15,000-Hz signals modulate the transmitter 100%. Now look at Fig. 3A, which shows deviation vs frequency for station A. Only program material between 50 and 15,000 Hz is being transmitted, and by using the pre-emphasis curve, you can see that only signals of about 15,000 Hz deviate the transmitter frequency ±75 kHz. Other program signals deviate the transmitter frequency correspondingly less. While some program material may contain little or no 15-kHz (or even 10-kHz) material, the pre-emphasis network is always in the circuit. Thus the transmitter audio input does not have flat frequency response. Fig. 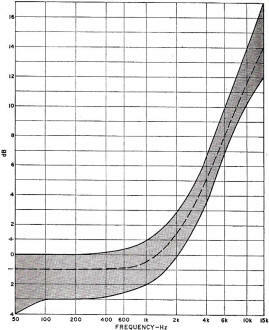 2 - Limits of standard FCC pre-emphasis curve for FM. At this point, many persons confuse two parameters - amount and rate of carrier deviation. 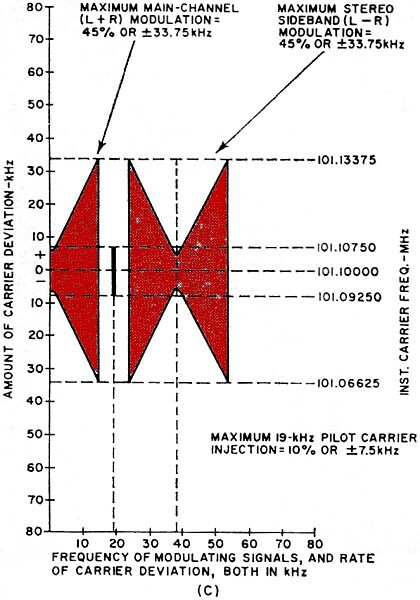 The amount of carrier deviation, in kHz, is shown along the left side of Fig. 3A. To the right of Fig. 3A is shown the instantaneous transmitter frequency in MHz, which is the result of adding or subtracting the deviation to or from the carrier, or center frequency. The amount of carrier deviation is caused by the amplitude of the modulating signal - irrespective of its frequency. Rate of carrier deviation is another thing. 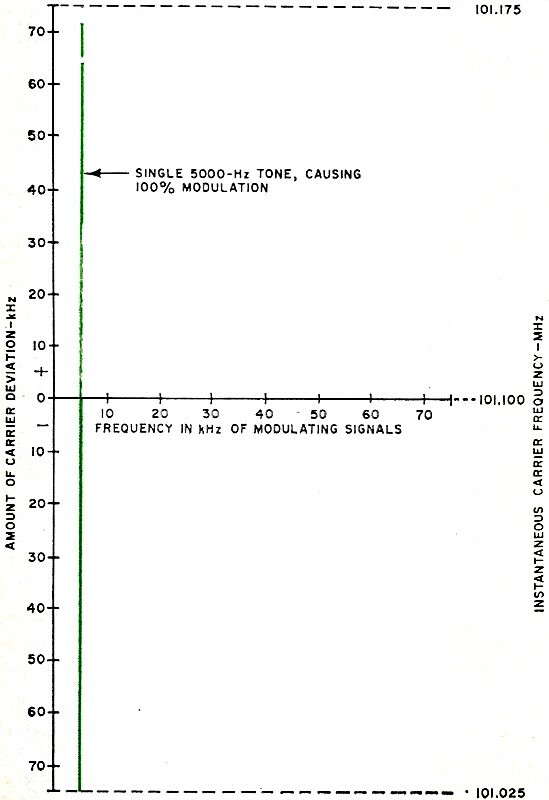 The instantaneous frequency of the modulating signal determines the rate of carrier deviation. For instance, in Fig. 1, a 5000-Hz sine wave is shown modulating the transmitter 100%, or causing a carrier deviation of ±75 kHz. Since the modulating signal is 5000 Hz only, it causes the transmitter frequency to deviate from 101.100 MHz to 101.175, and then to 101.025 and finally back to 101.100 MHz. That is one complete deviation cycle. Since the modulating frequency is 5000 Hz, he transmitter frequency changes or goes through that cycle 5000 times per second. Thus the rate of carrier deviation is equal to the frequency of the modulating signal. Another point of confusion is the relationship between the frequency of the modulating signal and the carrier-frequency deviation. Two terms are used to describe the relationship - modulation index and deviation ratio. These phrases are not synonymous, as some literature indicates. Modulation index (MI) is an instantaneous quantity in an FM transmission system. It is the ratio of a carrier-frequency deviation of the transmitter to the modulating frequency which causes that deviation. MI is a description of a process inherent in FM. Mathematically it is: MI=fdfm where MI equals modulation index (an arbitrary number), fd equals carrier-frequency deviation and fm equals modulating frequency, and where fd and fm are given in the same units (Hz, kHz, etc.). Obviously, MI can be changed by altering either fd or fm and holding the other constant. Deviation ratio (DR), on the other hand, is an arbitrary limit. It is the ratio of the maximum carrier-frequency deviation to the highest modulating frequency. DR can be established, then, at any value one wishes. For FM main-channel monophonic broadcasting, the FCC has limited DR to 5. 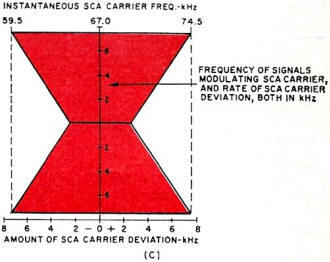 The maximum carrier-frequency deviation is 75 kHz, and the maximum modulating frequency is 15 kHz. Modulation index and deviation ratio are important quantities in FM transmission because of the very nature of FM itself. In AM transmission, 100% modulation is not arbitrary but a real limiting factor. 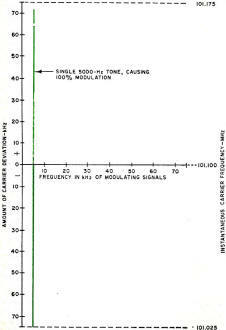 Modulation in excess of 100% in an AM system produces distortion, regardless of the receiver used to pick up the signal. The same is not true of an FM system. The 100% modulation figure for an FM system is established by the FCC for the particular class of service. 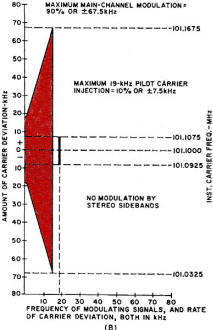 For FM broadcasting, the FCC defines 100% modulation as ±75 kHz carrier-frequency deviation. In various two-way radio services, the FCC defines 100% modulation as ±15 or ±5 kHz carrier-frequency deviation. No distortion is caused - at the transmitter or in free space - by exceeding any of these arbitrary modulation limits. The distortion is caused only at the receiver. If a ±5-kHz receiver is presented with an FM signal having ±15-kHz deviation, the receiver will produce distorted audio. In a properly adjusted AM system, only two sidebands are generated, and the bandwidth required for distortionless reception is twice the highest modulating frequency. This is not true in an FM system; in FM many sidebands are generated. Their amplitude and number depend upon the frequency deviation and the modulation frequency. In other words, the sidebands depend on the modulation index. At a monophonic FM station, if a sine-wave 15,000-Hz tone is transmitted at 100% modulation, it causes the carrier to deviate ±75 kHz. 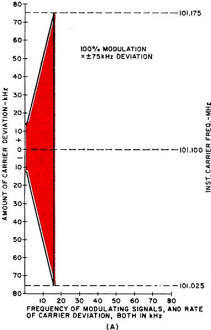 This tone causes eight significant sidebands to be generated on each side of the carrier frequency. For distortionless FM reception, any sideband greater than 1% of the peak carrier amplitude must be transmitted. Only the first eight sidebands meet this requirement. Others are generated, but they are too low in amplitude to be significant, so they may be ignored. The eight significant sidebands occupy a bandwidth of 240 kHz centered on the station carrier frequency. For distortionless FM transmission, a bandwidth of 240 kHz is required. The same is true at the receiver. Fig. 3A - Station A output, mono only. Commercial FM broadcasting was authorized by the FCC in 1941 in the band from 42 to .50 MHz. In 1945, the FCC reassigned that band to other services, and allocated the present band of 88-108 MHz to FM broadcasting. Not many commercial FM stations were on the air from 1941 to 1945, due to wartime equipment shortages. Additionally, the change in frequency bands made existing receivers obsolete. But, most of all, television was rapidly becoming the most popular broadcast medium in the U.S. during the years between 1946 and 1950. Thus, by 1950, there were few FM listeners, and consequently few organizations willing to spend money to advertise on FM stations. As a result, many FM stations went off the air or curtailed their operations, usually duplicating the broadcasts of their AM affiliates. Some stations, however, undertook a special form of service to bring in the revenue needed to keep themselves on the air. Various forms were used, called store casting, transitcasting, background music, and doctorcasting. These services consisted of music and/or other material transmitted on the main channel, which was intended for reception in supermarkets, transit vehicles, restaurants, offices, and/or factories. A special technique was used to boost receiver audio for commercial announcements aimed at customers in supermarkets and other locations. The shopper-listeners would hear music at normal volume level, and commercials at a higher level. If the music were transmitted to restaurants, offices, and factories, the receivers there were muted during such commercials. All subscribing receivers were muted during station breaks and newscasts. The special technique was simple. To boost receiver gain or mute the receiver speaker, sine-wave tones above 20 kHz modulated the transmitter. The station - or its legal agent-owned and leased special receivers to subscribers. In each receiver, resonant circuits responded to the particular tone and performed the designated job-boosting gain or muting the speaker. Receivers used by the general public did not respond to these supersonic tones, and so the public received all program material transmitted by the station. Since the control tones were ultrasonic, the public did not hear them, either. This technique was known as simplexing. It enabled many FM stations to stay on the air during those lean years from 1950 to about 1955. Then the FCC decided that simplexing was not serving the public properly. A new technique - multiplexing - had been developed, which enabled an FM station to carry a main-channel program designed to appeal to the general public, and at the same time carry another channel of information which could not be received by the public. This secondary channel could be used by the station to appeal to private subscribers - i.e., storecasting, transitcasting, or background music. The formal authority granted by the FCC to each station which wanted to carry this secondary, private service was (and still is) called a Subsidiary Communications Authorization (SCA). By obtaining an SCA, an FM station could continue to provide a private service to its paying subscribers, and still provide a service to the general public. U.S. broadcast stations must, by law, serve the public interest, convenience, and necessity. Broadcasting is defined by federal law as the dissemination of radio communications intended to be received by the public. The main-channel programs transmitted by FM stations are broadcasting, since they are intended to be received by the general public. But federal law protects the privacy of radio communications of any type except broadcasting, amateur radio, and distress signals. Federal courts have ruled that SCA transmissions are private communications - not broadcasts - between the originating station and its subscribers. Such transmissions are not intended to be received by the public. Fig. 3B - Station B output, mono plus one SCA channel. Fig. 3B shows what station B transmits. The main-channel program is similar to Fig. 3A, except that modulation does not deviate the transmitter carrier frequency as much. 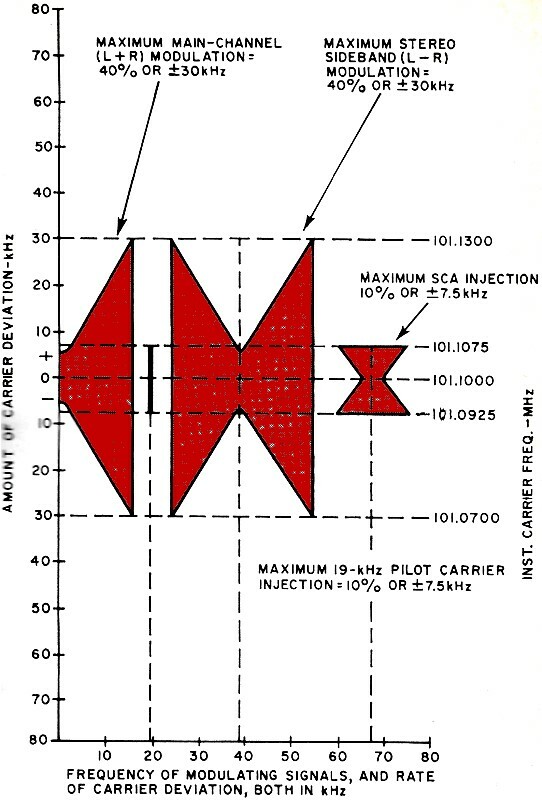 When SCA operations first began in 1955, various subcarrier frequencies were tried. Through the years, 26, 27.5, 32.5, 41, 42, 58, 65, and 67 kHz have been used. For this example, assume 67 kHz is the SCA subcarrier frequency. At the FM station, main-channel audio is fed to the, transmitter in the usual manner. But other equipment is used - called an SCA generator. This generator is actually a small FM transmitter. In the case of hypothetical station B, the SCA generator's center frequency is 67 kHz. Assume for a moment that the SCA generator is simply putting out a constant-amplitude, constant-frequency signal at 67 kHz. This 67-kHz signal is fed to the station transmitter, along with the main-channel audio from 50 to 15,000 Hz. If the main-channel audio caused the transmitter to deviate ±75 kHz and the SCA signal were added, it would cause the transmitter to deviate farther, or in excess of the FCC-defined 100%-modulation limit of ±75 kHz. Therefore, the main-channel modulation level is backed off to allow the SCA some room for modulation. The amount of SCA signal fed to the transmitter is called infection, and the FCC limit on injection is 30% of total modulation - no matter how many SCA transmissions are being carried. Fig. 3B shows the SCA carrier injection as 30%, or ±22.5 kHz; that is, the SCA signal causes the FM station's transmitter to deviate ±22.5 kHz from its center frequency. 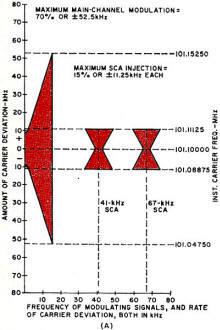 Since the SCA modulates the transmitter 30%, the main-channel audio modulation must be backed off to 70%, or ±52.5 kHz. Refer to Fig. 3C, which shows only the SCA signal, as if the SCA generator output were being fed directly into an antenna. Actually, of course, the constant-amplitude SCA signal centered on 67 kHz is injected into the station transmitter. Now although the amplitude of the SCA carrier remains constant, its frequency does not. Modulating signals (usually audio) fed into the SCA generator cause the SCA frequency to deviate, and this deviation is shown at the bottom of the figure. The amount of maximum deviation is ±7.5 kHz. 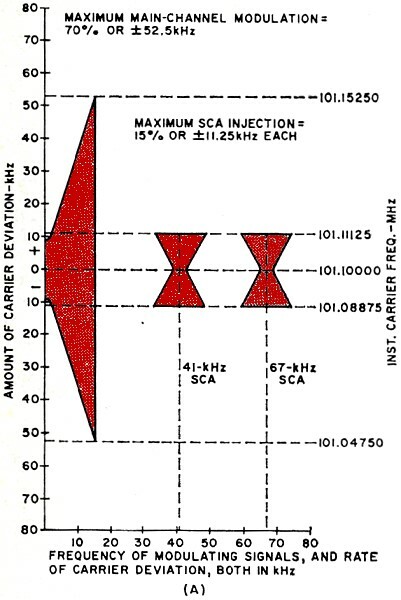 At the top you see the instantaneous SCA carrier frequency, which is 59.5 kHz at one extreme and 74.5 kHz at the other. Fig. 3C - Station B's SCA channel only. Since pre-emphasis is used at the SCA generator, high audio frequencies are boosted above the level of low audio frequencies. The vertical axis can be read as the frequency response of the SCA subchannel. As you can see, only 7500-Hz signals cause maximum 7.5-kHz SCA carrier deviation. Lower audio frequencies cause correspondingly less deviation. Thus SCA operation is actually FM on FM. Inasmuch as SCA injection is held to a low value, this FM-on-FM feature is beneficial, as it betters the noise immunity of the SCA subchannel. Fig. 4A shows what station C transmits. Main-channel audio is the same as in Fig. 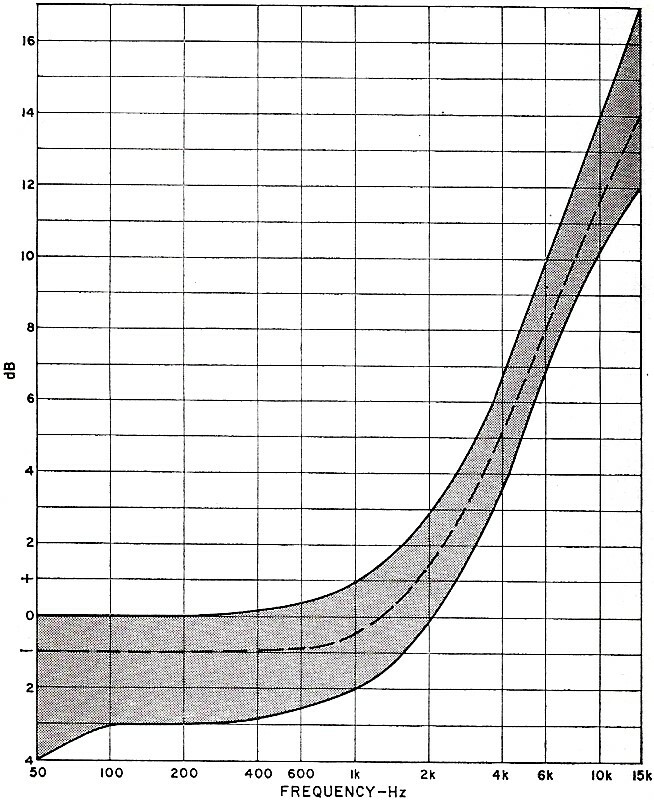 3B; audio material between 50 and 15,000 Hz is transmitted with a 75-μs pre-emphasis curve. Maximum main-channel modulation is 70% or ±52.5 kHz. Fig. 4A - Station C output, mono and two SCA channels. Since the FCC limits total SCA injection to 30%, it's obvious that each SCA subcarrier can be injected to only 15%. 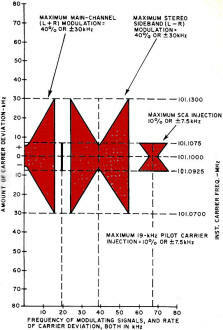 Each subcarrier can cause the station transmitter frequency to deviate only 11.25 kHz. As with station B, each SCA generator is modulated with its respective audio. 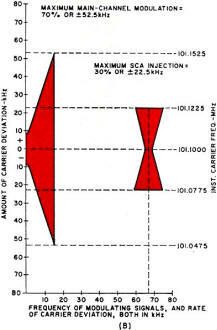 SCA deviation is ±7.5 kHz, and the over-all frequency response is from 30 Hz to 7500 Hz. To more easily understand stereo FM, assume that station D is not transmitting normal program material, .but sine-wave tones. To begin with, assume two identical audio generators each putting out 1000-Hz sine waves, representing the left and right channels of stereo program material. In addition, a stereo pilot carrier generator furnishes a constant-amplitude, constant-frequency signal of 19 kHz. Assume that when 10 volts of audio in the range of 50-75,000 Hz is fed to the station transmitter, it causes 100% modulation, or ±75 kHz deviation of the carrier. 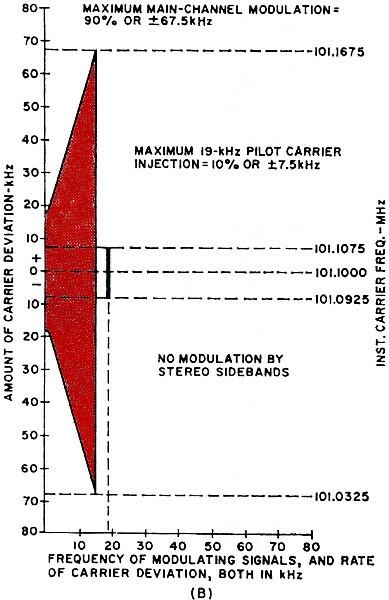 By FCC rule, the 19-kHz stereo pilot signal is allowed 10% injection, which deviates the transmitter frequency ±7.5 kHz. Therefore, assume the pilot generator furnishes 1.0 volt to the station transmitter. That leaves 9.0 volts for all other modulation. In order that the stereo-FM system be compatible, listeners with monophonic receivers must receive total program audio. Thus the 1000-Hz sine-wave tones from the left and right audio generators are fed to the stereo generator, where they are added together. This combination signal is fed to the station transmitter. Since the 19-kHz pilot is already modulating the transmitter 10%, only 90% is left for the main-channel signals. Therefore, assume that L is 4.5 volts and R is also 4.5 volts. When combined (L + R), they total 9.0 volts, which furnishes 90% modulation of the main channel. Fig. 4B - Station D output with its 19-kHz pilot signal and with all information in the main channel. Meanwhile, the stereo generator also subtracts the two signals (L - R) to form the stereo difference signal. The 19-kHz pilot signal is doubled to produce a 38-kHz carrier which is amplitude-modulated by the L - R signal. Then the 38-kHz carrier is balanced out and removed. (Since no balanced modulator is perfect, the FCC permits a residual 38-kHz subcarrier which causes no more than 1% modulation of the main carrier.) The remaining sidebands are injected into the station transmitter. Remember that the main-channel signal - occupying the band of frequencies from 50 to 15,000 Hz - is composed of L + R. The stereo sidebands are composed of L - R. When Land R each equal 4.5 volts, L + R equals 9.0 volts. Thus main-channel audio modulates the station transmitter 90%, the stereo sidebands modulate the transmitter zero percent, and the 19-kHz pilot modulates the transmitter 10%. This situation is shown in Fig. 4B and is practically a pure monophonic signal. In stereo program material, however, the Land R signals are not always equal in amplitude. Often one channel is quite loud with respect to be other. At the extreme, one channel contains maximum signal while the other contains zero signal. Assume that L equals 4.5 volts while R equals zero volts. Then, L + R equals 4.5 volts, and L - R also equals 4.5 volts. Thus main-channel audio modulates the station transmitter 45%, while the stereo sidebands also modulate the transmitter 45% (Fig. 4C). Note that the main-channel modulation level is only 45% (deviation of 33.75 kHz). That is half the maximum modulation possible when L equals R, or a drop of 6 dB. Some stereo FM stations put the announce microphone on only one channel, with the result that mono listeners hear announcements 6 to 8 dB below the music. The announce-mike channel should be split equally between the channels. Fig. 4C - Same as part (B) except that sum and difference stereo signals are equal. The stereo difference (L - R) signal has the same frequency response as the main-channel signal, namely from 50 to 15,000 Hz. It also uses the same 75-μs pre-emphasis curve. It amplitude-modulates a 38-kHz carrier, which carrier is then suppressed to less than 1% modulation of the station transmitter. These AM sidebands occupy frequencies from 23 to 53 kHz, as shown in Fig. 4C. Some articles show both the main channel and the stereo sidebands with maximum possible modulation of 90% of the station transmitter. This is erroneous and misleading. It is never possible for both the L + Rand L - R signals to simultaneously modulate the transmitter 90%. If the station is operating properly (i.e., not overmodulating), the L + R main-channel signal can modulate up to 90%. The L - R stereo sidebands can modulate only up to 45%. Such maximum modulation by the stereo sidebands is possible only for an L-only or an R-only signal. At the same time that the stereo sidebands modulate the carrier up to 45%, the main channel also modulates up to 45% - and no more. It is technically possible for the stereo sidebands alone to modulate the transmitter up to 90%, but the station is then being operated improperly. Assume for a moment that L equals +4.5 volts, while R equals -4.5 volts. Obviously the main-channel L + R signal equals zero, so there is zero main-channel modulation. Also the stereo difference or L - R signal equals +9.0 volts. Thus the sidebands modulate the station transmitter 90%. But if L equals +4.5 volts and R equals -4.5 volts, the stereo system at the station (or the program source) is out of phase. While the stereophonic listener will hear something, the monophonic listener will not. Thus 90% modulation by the stereo sideband signal is a technically improper condition which should never occur. It is technically feasible to transmit a single SCA subchannel (but no more than one, because of increased crosstalk) along with stereo programming from a single FM station. Fig. 5 shows the signals transmitted by station E. Since the stereo sidebands occupy much of the spectrum above the main channel, very little room is left for the SCA subchannel. Although the FCC does not specify 67 kHz, this frequency is probably the most widely used by stereo/SCA stations. (A few use 65 kHz.) Most stereo receivers use 67-kHz traps to prevent SCA crosstalk into the stereo channel, and most SCA receivers use 67 kHz as the first available frequency. FCC rules permit only 10% SCA injection while stereo is being transmitted. Thus the SCA subcarrier deviates the main carrier ±7.5 kHz. Since the 19-kHz pilot is also injected to 10%, only 80% is left for both the main channel and the stereo sidebands. As before, this 80% modulation is shared by both the main channel and the stereo sidebands. When L equals R the main channel modulates 80% and the sidebands modulate zero percent. As mentioned before, however, this situation is practically the same as monophonic operation. When L equals its maximum voltage and R equals zero voltage, the main channel modulates 40% and the sidebands also modulate 40%, as indicated in Fig. 5. Everything stated previously about station D is also true of station E, except that the modulation limits are now 80% (±60 kHz) for the main channel and 40% (±30 kHz) for the stereo sidebands. Fig. 5 - Output of station E, transmitting stereo and SCA. Many people have misleading impressions about the monophonic, stereophonic, and SCA signals transmitted by U.S. FM broadcast stations. Much writing on the subject ignores the effect of the pre-emphasis curve. This curve means that low frequencies in the program material can be transmitted as much as 15 dB below the highs - even if the transmitter is being modulated 100%. That the deviation ratio changes when a station transmits SCA or stereo signals is also little known. Compare main-channel DR for the five examples cited above. Station A modulates 100%, deviating ±75 kHz, for a DR of 5 (75/5). Stations Band C modulate only 70% on the main channel, deviating to 52.5 kHz for a DR of only 3.5. Station D can modulate to 90% when L equals R, deviating to ±67.5 kHz, for a DR of 4.5. Station E can modulate to 80% when L equals R, deviating to ±60 kHz, for a DR of 4.0. The stereo sideband signals transmitted by stations D and E have even lower deviation ratios. The stereo sidebands of station D can modulate its main carrier to only 45%, deviating it to ±33.75 kHz, for a DR of only 2.25. At station E, the figures are still lower - 40% modulation, deviation of ±30 kHz, and DR of only 2.0. A comparison of the volume levels heard by the listener with a monophonic receiver is also interesting. Station A is the reference, since it can modulate to 100%. Stations B and C can modulate to 70% (on the main channel), a drop of 3 dB from station A. (Of course, some stations use SCA injection of less than 30%, which allows them a correspond­ingly higher main-channel modulation level.) Station D can modulate its main channel to 90%, a drop of only 0.9 dB, and station E can modulate its main channel to 80%, a drop of only 1.9 dB. But one thing must be obvious by now. In normal programming, FM stations don't transmit sine-wave tones, don't transmit white noise with full and flat frequency response from 50 to 1.5,000 Hz (for the mono and stereo) or from 30 to 7.500 Hz (for SCA). And they don't transmit everything at the maximum allowable modulation all the time. This discussion has cited the extremes, the limits, and the rules. The signals transmitted by most stations vary considerably in volume, frequency, and waveform. In particular, stereo program material more often has most of its volume in the main or sum channel, with correspondingly less in the difference or sideband channel. This is good for the mono listener, for he hears a relatively loud signal not much different in volume from what he gets from mono-FM stations. Furthermore, the mono signal-to-noise ratio is kept relatively high during such stereo programming. But whenever stereo program material becomes too extreme ("leftish" or "rightish") the mono listener suffers. As the program material approaches L-only or R-only, main-channel and stereo sideband modulation levels both drop to near 4.5% (or 40% if SCA is being transmitted). That is a volume drop of 7 to 8 dB for the main-channel listener, compared to a monophonic signal. One might state a fundamental principle: Extremism in pursuit of stereo is a vice. Confusion also abounds regarding the transmission of SCA signals as they affect mono and stereo listeners. One charge often leveled at FM broadcasters is that by transmitting SCA signals, they are degrading their public broadcast signals, The charge is true, but what is seldom pointed out is that such degradation is insignificant. In the examples cited, stations Band C transmit one or two SCA subchannels, using up to 30% injection and backing off the main-channel modulation to 70%. At most, this is a drop of 3 dB, which is scarcely noticeable to most listeners. While the signal-to-noise ratio on the main channel has been lessened somewhat, the effect is so small as to pass almost unnoticed. If the transmitting equipment is adjusted properly, crosstalk from the SCA's into the main channel is negligible. The FCC, in fact, requires such crosstalk to be at least 60 dB below 100% modulation. At stations D and E, the situation is more complex. To begin with, station D's main-channel signal is down 10% (0.9 dB) because of the pilot signal. At station E, adding SCA drops the main-channel level another 10%, making the over-all drop 1.9 dB. But note that a 0.9-dB drop is necessary just to transmit stereo, and the SCA service itself causes a drop of only 1.0 dB; both are barely noticeable. Crosstalk from the SCA into the stereophonic sideband signals is also negligible at station E. Again the FCC requires such crosstalk to be at least 60 dB below 100%. Finally, what about the SCA subchannel? The service is anything but high fidelity: Frequency response is 30-7500 Hz, and since deviation ratio is 1.0, signal-to-noise ratio is poor. In fact, most SCA generators mute themselves during near-silence on their audio inputs. This serves to mask main-channel and stereo crosstalk into the SCA channel. Dynamic range on SCA channels is also small, since high levels of audio compression and limiting are used in an attempt to keep the signal-to-noise ratio as high as possible. The SCA, then, is a limited-range service which detracts only slightly from either mono or stereo broadcasting. Further, it doesn't require additional spectrum space.